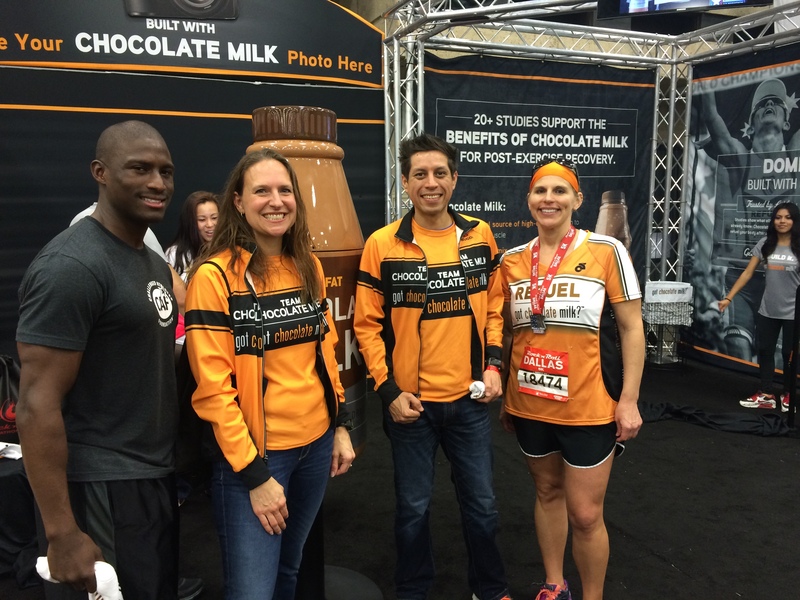 Sunday was my first official race with Team Chocolate Milk at the Dallas Rock ‘n Roll half marathon, and what a great experience! This was my third year to run this race, but the course this year was different. I remember seeing the Got Chocolate Milk booth at the expo last year and wanting to be a part of it. I started my weekend on Saturday at the expo. I met some of the other members of the team. I also bought a new pair of compression socks, and we got some wireless headphones to share. These were big splurges for me. I usually don’t run with music since I run early, and I want to hear noises around me in the dark. But I’ve noticed during races, my energy picks up with music along the course. So my husband will use these while he bikes, and I’ll use them for daylight runs and races. 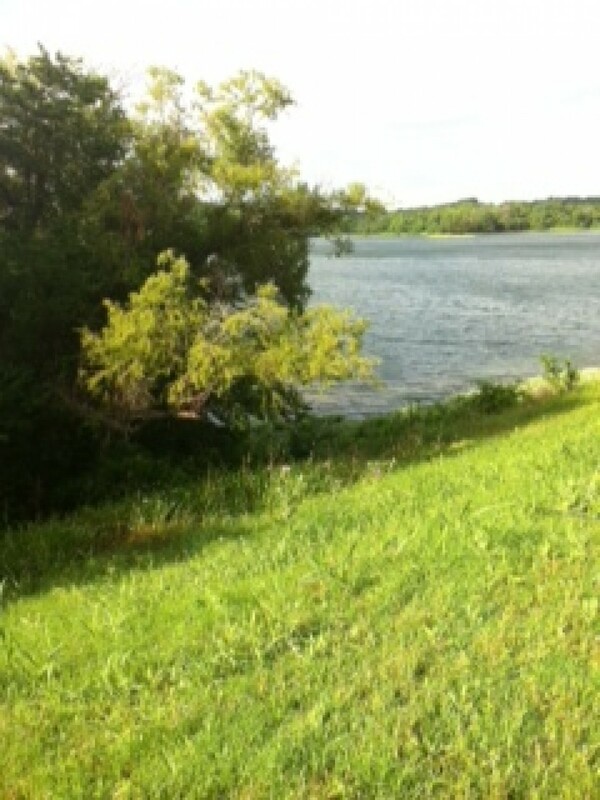 The weather was great for running Sunday morning. Low 50s and I was in shorts. I headed to the VIP lounge, which was indoors. This was a new experience for me. 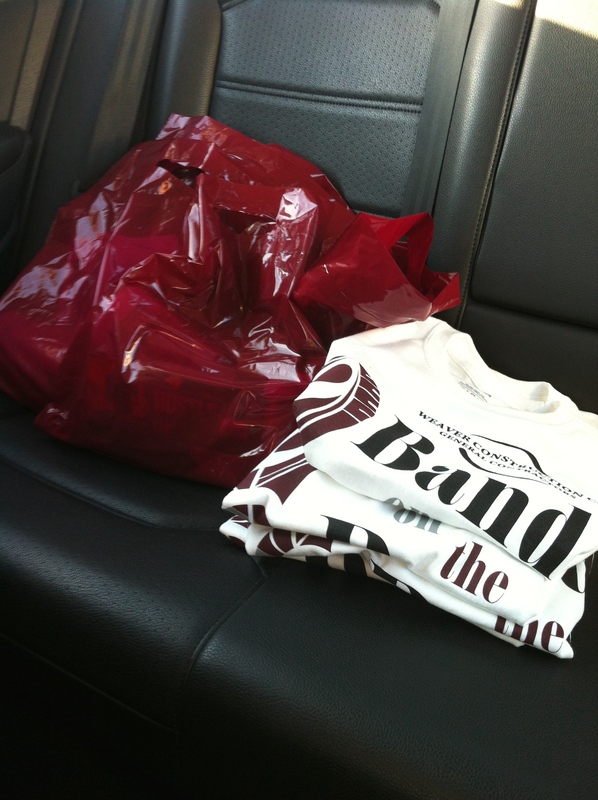 There was food, VIP gear check, and restrooms (yay – no porta-potty). I met up with other team members there and we talked about goals, past races, and upcoming ones. I made my way to the start corral, and quickly found several runners from our local group. 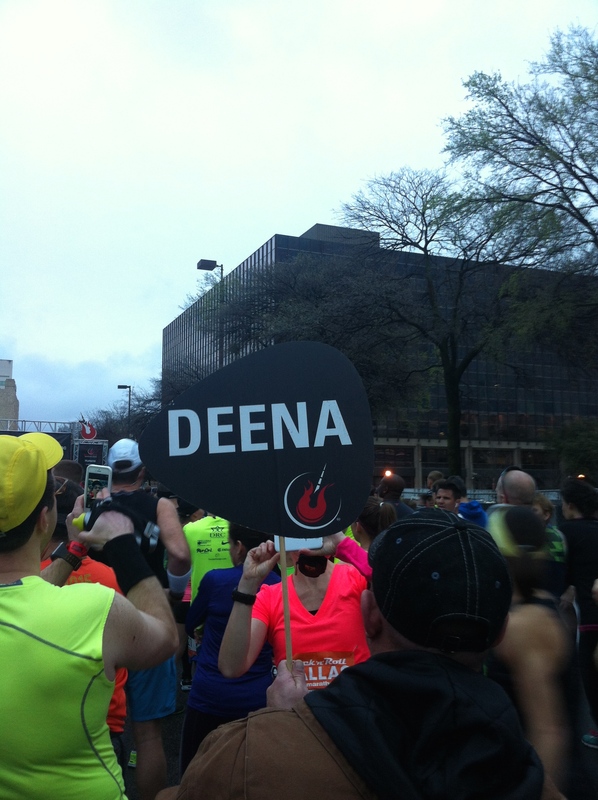 We lined up behind this sign hoping for a glimpse and the chance to run with her. Deena Kastor was pacing a 1:45:00 group, and yes I am fully aware it is out of my range but I thought it would be fun to start there. I even managed to get this high quality photograph before she moved out of the corral. Somehow, they ended up starting behind us. 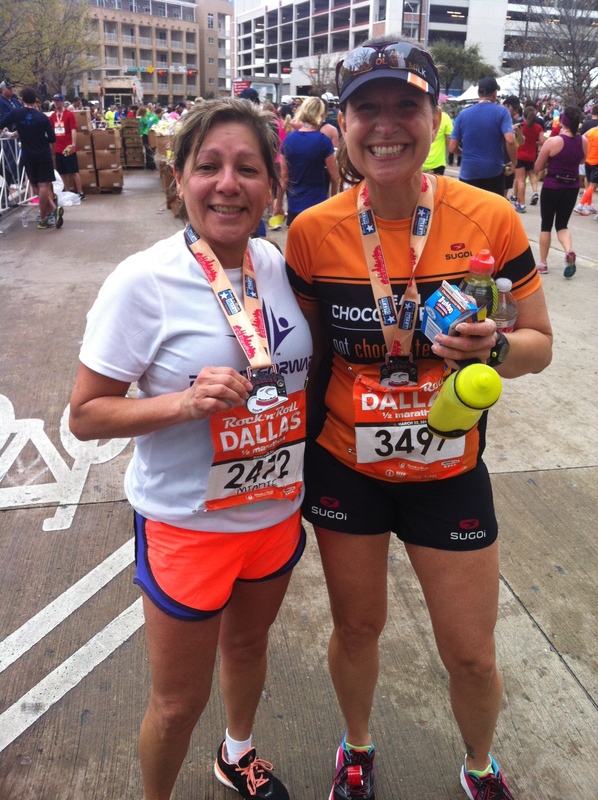 My fast running group friend – I call her my rabbit – kept trying to tell me I could run a 1:48. She would get me there. I had no doubt that she could, but I have been doubting myself so much lately trying to find my speed that went missing since November. She said she would pull me along and I would PR. My PR was at this race last year (1:50:42). I told her I would be happy to just run under 2 hours. I wasn’t sure what to expect with the course change, but I started off trailing my friend for the first mile – which I ran in 8:24. She stayed just ahead of me and I was amazed that I could hang on. By mile 3.5, I heard the sound of feet and chatter. I bet that’s Deena’s group, I thought. They caught me and I hung on for almost a quarter of a mile, before they moved ahead. But hey, I ran with an Olympian! 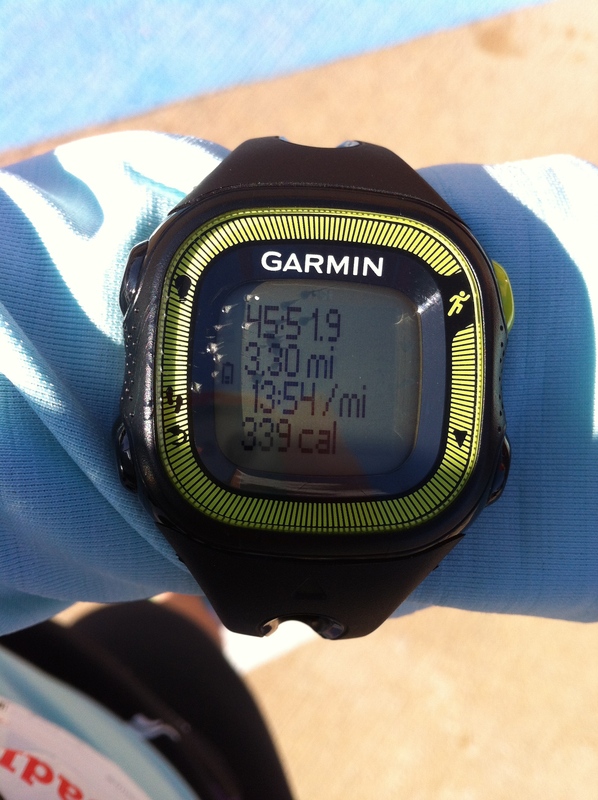 I saw my husband at mile 4, waved, and pointed to my Garmin. “Too fast!” I yelled. He smiled. By the end of mile 5, my average pace was 8:06 and I hit my lap button. I had lost sight of my fast friend but I kept pushing. Miles 6-10 were tougher. My legs started to feel like jell-o after the climb to the Margaret Hunt Hill Bridge. I don’t know if it was the hills or the speed that was doing it, but the average pace for those miles was 8:35. I did some amazingly quick math in my head to realize I was still on PR pace. 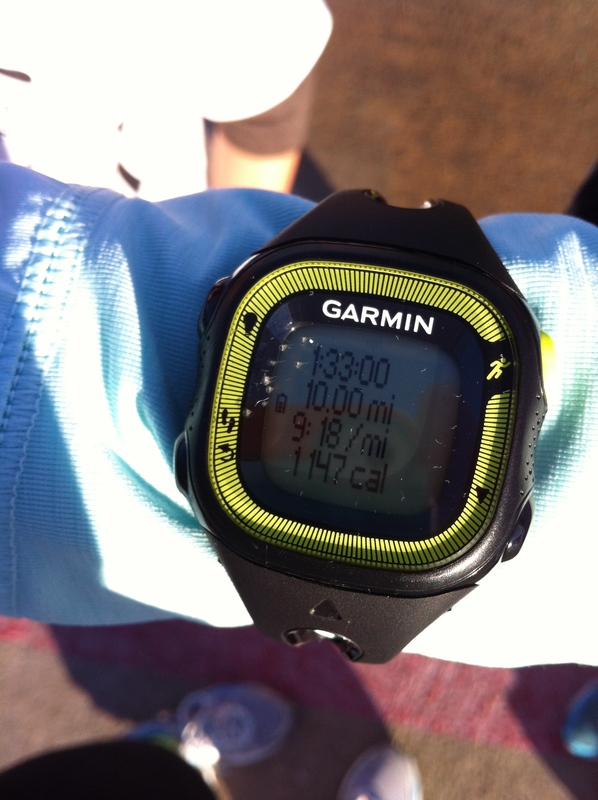 Then mile 10, a wave of nausea came over me and I took a quick walk break. I was low on Nuun in my handheld and I was feeling the humidity. 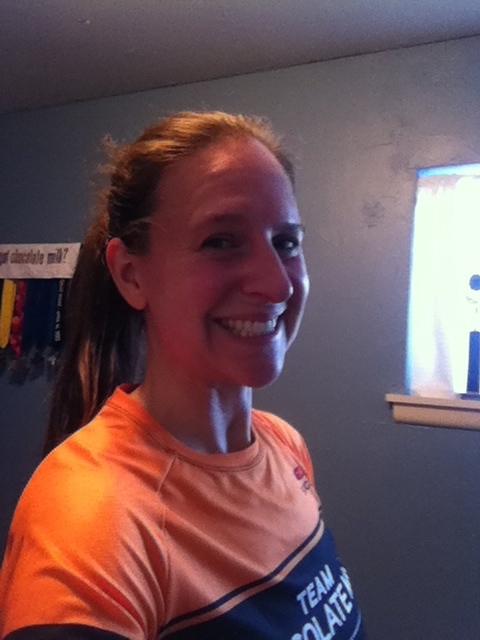 I worked through the next mile with a 9:26 pace. Mile 12 was a little better at 8:49. I would get nauseous, walk, then run hard, and repeat. The last mile ended up being 9:26 but I finished strong. The crowds along the last 1/2 mile were great and there were no more hills. The best thing about the race, and honestly it kept me motivated through the last three miles, was knowing there would be chocolate milk at the finish. I have seen overall improvements since I began using chocolate milk for recovery after long and/or hard efforts. The carb to protein ratio is perfect for me and it’s easy on my stomach post race. You can find more info on the science behind it here. Also, chocolate. Need I say more? Even though I struggled for the last 5k and my time was 3 min. 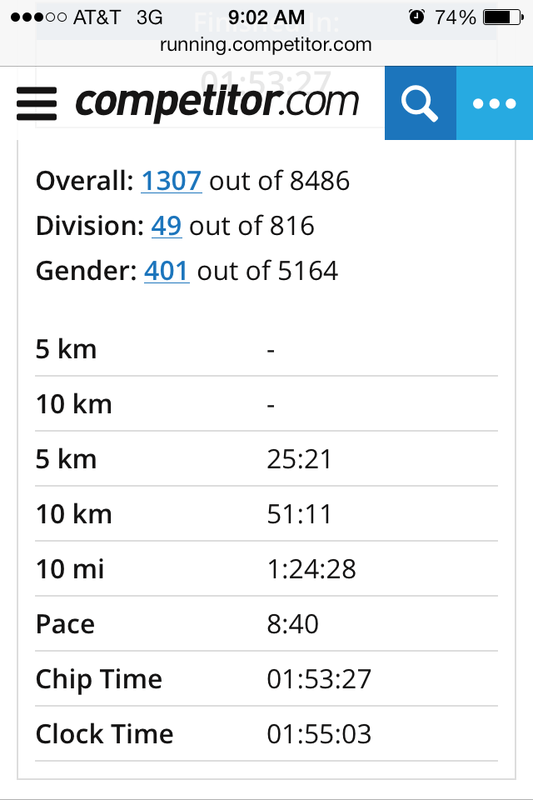 slower than last year, I am still happy with my performance. I ran faster for a longer distance than I have been able to since the Blue Red Run in November. I fought against the demons that told me I was getting older, heavier, and slower. My speed is still there; I just needed someone to help me find it. She is one fast lady! After the race, I found my husband then headed to the VIP area to get my bag and some more food. 🙂 There was a buffet with hot food, and even more chocolate milk. I will say this – Rock ‘n Roll races do it right! Two days later, my quads were still feeling the effort and the hills, and it hurts so good to know I ran hard. I am so grateful to have had this experience, and I can’t wait for the chance to again represent Team Chocolate Milk! 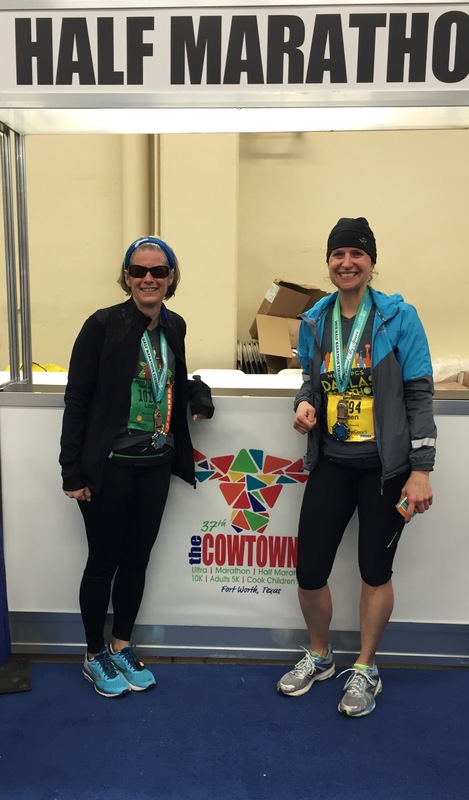 About the time I became happy about short “long” runs and my half marathon schedule, I received notice that the Cowtown Marathon was allowing a virtual race option. I spent the better part of a workday trying to decide if I wanted to do the virtual marathon. The second task was to decide if running 26 miles less than three weeks before my next half marathon would mess up my time. I had until the end of the month to complete it, but I was ready to be done with long runs and I needed my speed to come back for my shorter races. 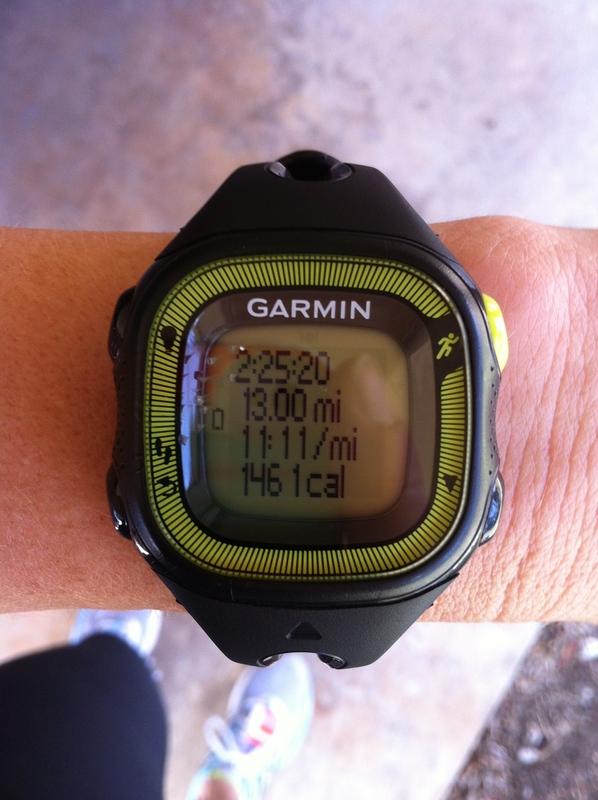 I also needed to drop the marathon weight gain, and that doesn’t happen when I fuel up for long runs. A fringe benefit to running 26.2 would be burning off more of those carbs I had loaded up on, even though a week late. When I told my husband about it, he said “do it.” We had a family 5k that Saturday (March 7th) and I decided to work that into my virtual marathon. I would run as much as I could before the 5k, run the 5k, and then finish. I would not be carbo-loading. I would not push too hard, and I would take enough walk breaks so I could return to training the following week. After work Friday, I stopped to pick up race packets for the first annual Band on the Run 5K. I was excited about this race for several reasons: local race, band fundraiser – saves us money as band parents, spaghetti dinner included with the registration, nice goody bags and family fun! Then we headed to the spaghetti dinner/band concert. Yum. Carbs. Saturday morning, I tried to start early. I wanted to be at least halfway done before the 5k. 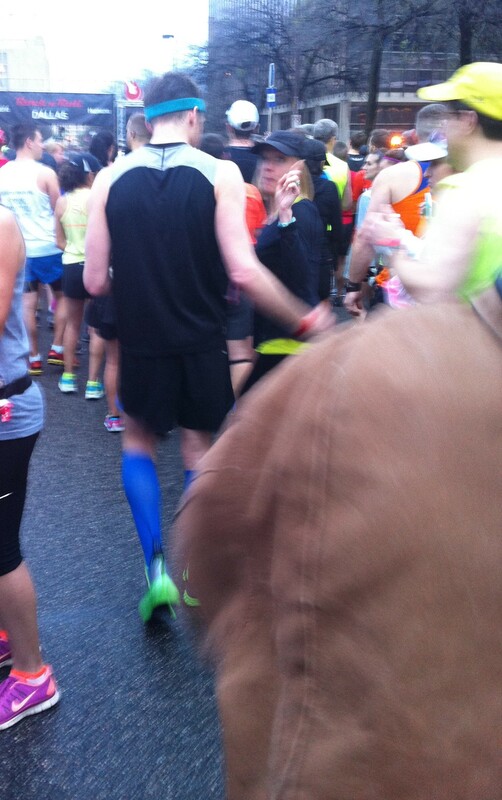 We came to the last turn with less than half a mile to go and I grabbed her hand. “Come on! We run all the way through. The band was playing for everyone that finished and it was great. These two finished before we did. The best part was the awards ceremony. 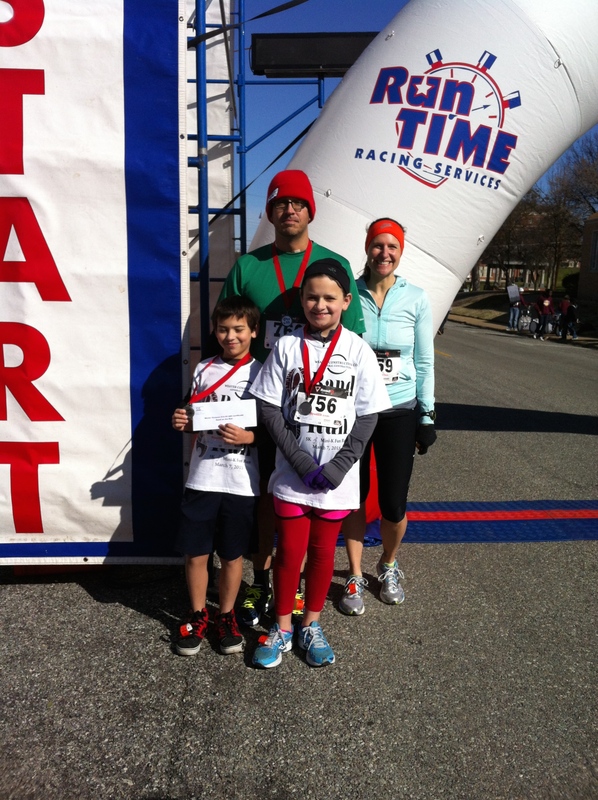 The little ones placed in their age groups (benefits of a small race) and so did my husband. Not bad for a first timer. After that, they headed home and I set out for the second half of my virtual marathon. By then it was warming up and before I made it back to my neighborhood I had shed the headband and jacket. Then I trudged through the rest of my miles. I should’ve worn sunscreen – or my visor. Running a marathon is hard. Running it in three stages like I did made the overall distance seem shorter, but the morning sure was long. But I got it done. I wasn’t wiped out like I normally am after a marathon, but my legs sure felt like they covered 26 miles. 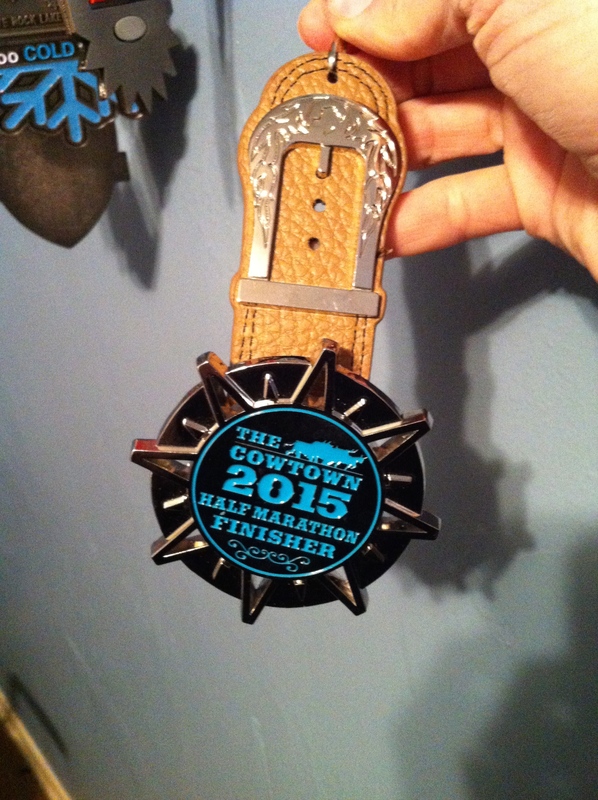 I may not have qualified as a Marathon Maniac this time, but I earned my Cowtown marathon medal and shirt. 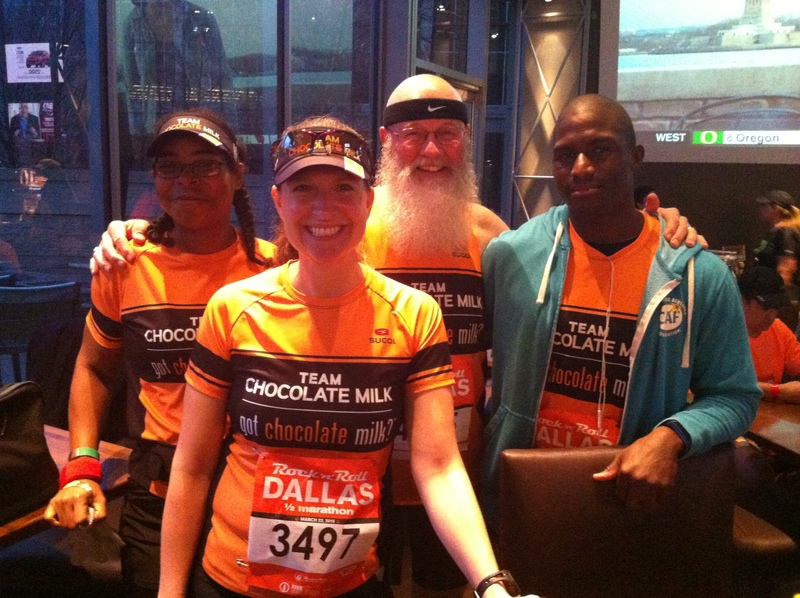 Now on to my next race which is this Sunday – the Rock ‘n Roll Dallas half marathon with Team Chocolate Milk. 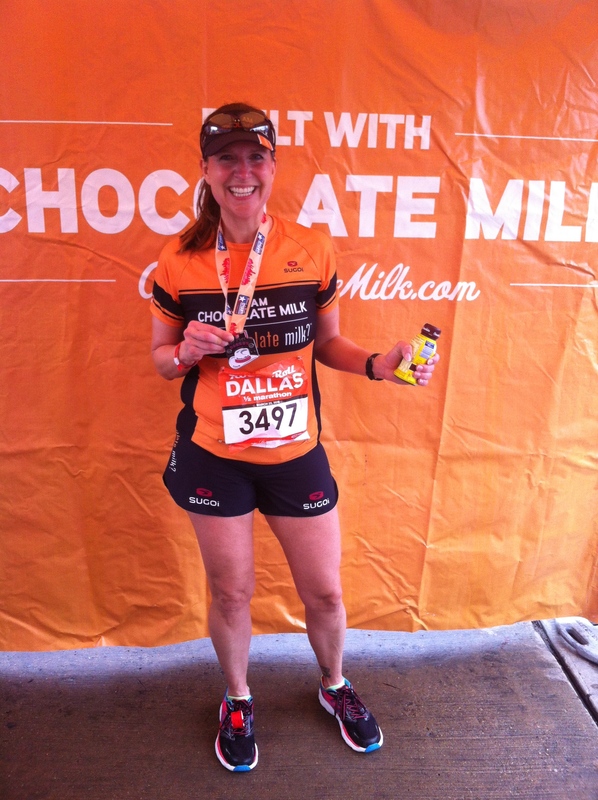 I’m so excited about this race, and I know there will be chocolate milk at the finish! Yay! It’s only been a little over a week since I planned to write my recap, but so much has happened since race week, I’m going to split it up. So hang on, and I’ll try to have the Cowtown recap done before the dust settles on my medal. Our “snow days” early in the week had just enough sleet and wintry mix to mess up the roads. 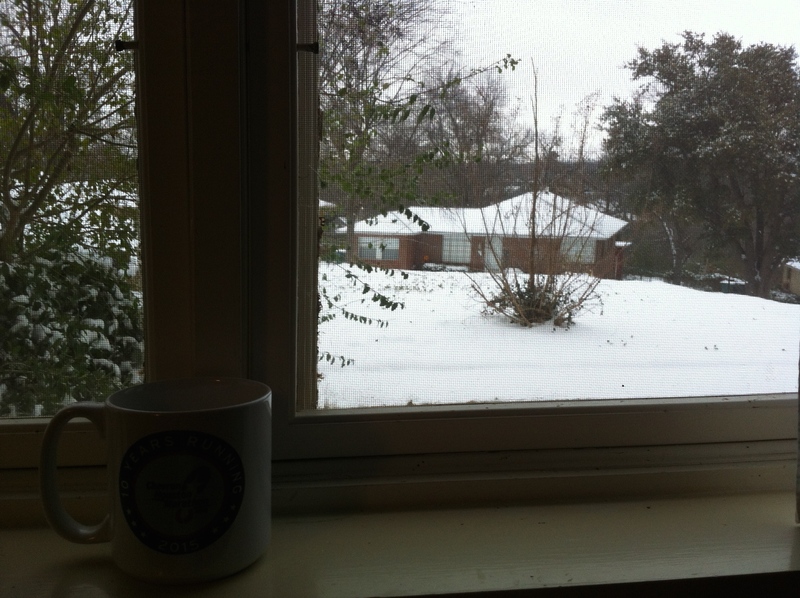 That Friday, more snow/ice mixture moved in and covered a broad area in the metroplex. The entire Cowtown race weekend was impacted by this round. The temperatures for the weekend did not cooperate, and the Saturday races (5 and 10k) were cancelled. Late Saturday afternoon the decision was made to cancel the full marathon and the ultra due to safety concerns. Portions of the courses were still icy. The remaining option available was that everyone (who could get there) could run the half marathon and it would start an hour later. I was disappointed I wouldn’t get to run the marathon, but being able to run the half was better than nothing. 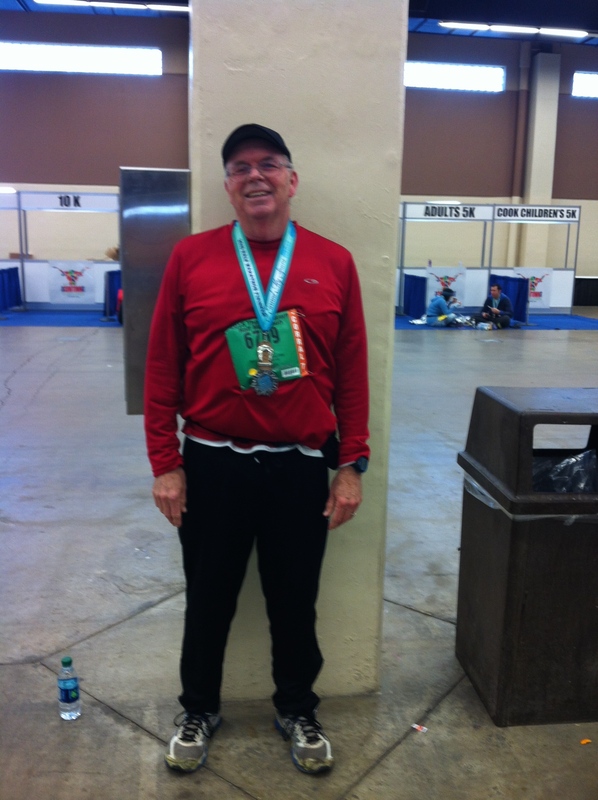 And I didn’t want to miss seeing my dad finish his first half marathon! Sunday morning didn’t bring any more overnight accumulations, so after pleading with my husband and coming up with an alternate route, I set out for Fort Worth. There were some slippery sidewalks walking up to the race site, and my first thought was “I didn’t make it this far to bust my tail on a sidewalk.” I opted to walk in the grass or on the street. The city of Fort Worth had brought out sand trucks to take care of the slick bridges on the course. 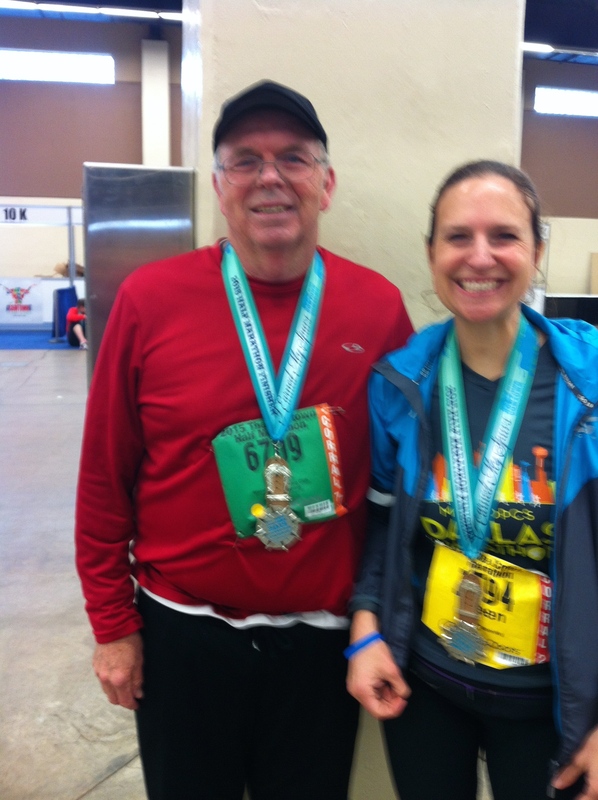 Race morning was cold (33 degrees) and rainy, but I found my dad and he was ready to run. I met up with my friend who had driven down on Saturday and picked up our packets. We started the race together and I quickly realized it was not PR conditions. I tried to formulate a goal, but I couldn’t settle on one. I was just happy to be there after all the stress from the day before. So I just ran. There was some fancy footwork in places due to ice that had been sanded, but after five miles I started to pick up the pace and felt good. I was able to get my pace under 9:00 miles for the next few miles, and I was happy to see that since I’ve struggled with speed since December. There was only one problem that kept me from fully enjoying the race. 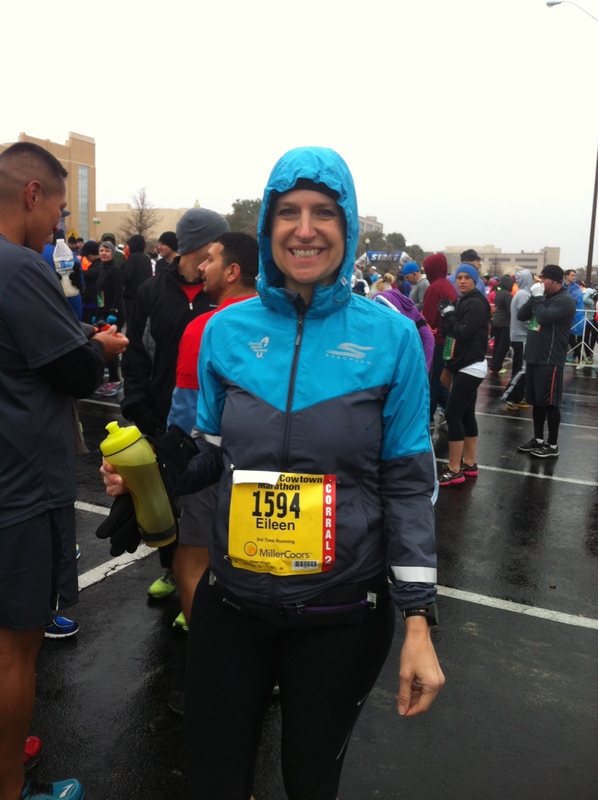 My long sleeve top under the lightweight Houston Marathon jacket proved to be too warm. I took my gloves off and zipped them in the pockets. But I was stuck with my jacket on, because I pinned my bib to it. Then around mile 8, my saving moment came in the form of a train. That’s right, lots of runners got stuck at a railroad crossing waiting for the train to go by. I heard some laughter, but I saw it as the perfect opportunity to re-pin my bib to my shirt and tie my jacket around my waist. I don’t know how long others were stopped, but I lost about a minute and a half. It sure made the rest of the race more tolerable though, and I learned a valuable lesson. Never pin the bib to the jacket. I survived the hills, and after the mile 9 bridge I was so happy that my race was almost finished. My official time was 2:01:36, but according to my Garmin I ran 2:00:04. Notice where the bib is now! My dad finished his first half marathon – at age 65. That is why I started this blog. That’s why it’s called “Anyone Can Run.” My dad never thought of running, even though he coached football, basketball, and track for more than twenty years. All it took was someone to tell him he could do a 5k. After that, he said he’d never run more than a 5k. Then he did a few 10ks. Now look at him with his first half marathon medal! 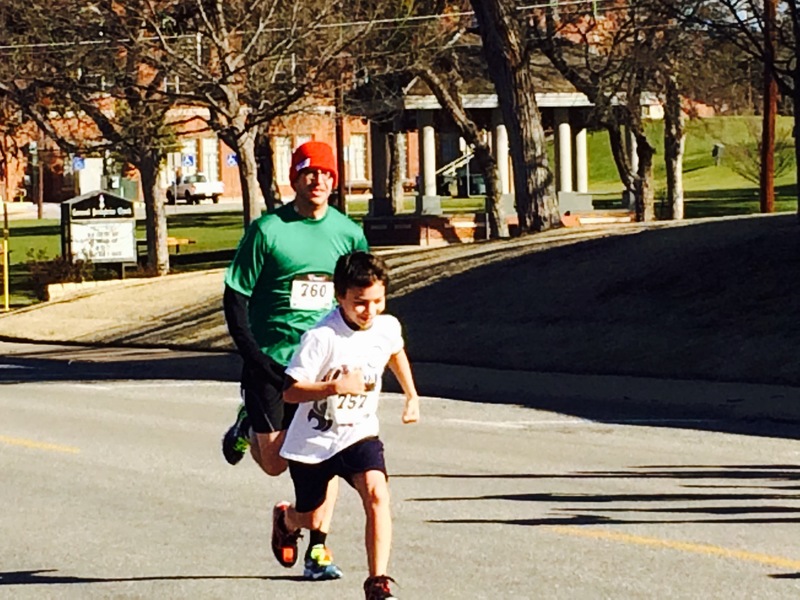 That evening, my calves and glutes reminded me of the toughness of the Cowtown course – made tougher by the weather. This the second medal in a 3-year series and I’ll be back next year to finish it. 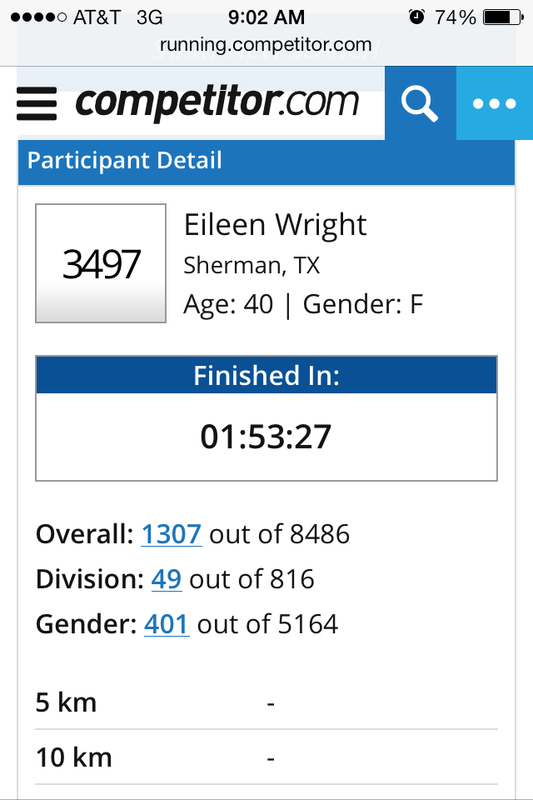 Even though it doesn’t say “marathon finisher” I still worked my tail off. Part of me was happy to be done at mile 13 that day and finished with 16 and 18 mile runs for a while. Or so I thought…until I received the virtual race option.